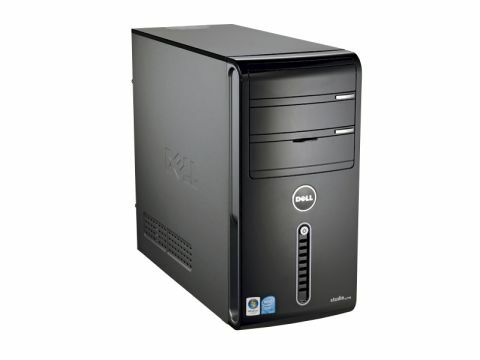 Can a grand really buy you one Dell of a system? Certainly not the best PC in the world, but a fairly decent stab at the 'budget' Core i7 though. We're still fairly shocked when a new Core i7 system drops into our ample (but muscular) laps, costing less than a grand; and it's even more shocking when the name emblazoned upon the chassis is none other than Dell. Dell's Core i7 is by far the teeniest PC to feature the much-vaunted processor that we've seen so far. Looking more like something you'd see in a buttoned-down office than a gamer's pad, its kempt exteriors don't exactly scream 'performance'. But, it's what's inside that counts, and Dell has shoved in the lowest-end Core i7 processor, and backed it up with 6GB of RAM, a terabyte of storage and a Radeon 4850 graphics card. It's all good – apart from the choice of graphics card. Not that the Radeon 4850 is a bad card, it's just a fundamentally middling one, and it seems like a weird choice to go with other high-end components. It's the card that inevitably brings the benchmark results down to around the same level as high-end PCs we were looking at this time last year. Which isn't all that good, really. So, it looks more like Dell is going for non-gamers with the Studio XPS. The ton of RAM and masses of hard disk space are great for high-definition video editing and billion-pixel photo manipulation – the inclusion of a 64-bit operating system seems to support this. We always thought XPS referred to high-end gaming PCs, but that's apparently changing. In fact, Dell is going to be using the Alienware brand from now on for gaming-specific systems. This chassis and configuration then, will disappoint anyone after a gaming system for around the grand mark. The addition of the word 'Studio' to the XPS name suggests a return to a more elegant PC for a more civilised time. But even so, we can't help feeling we've been sold short. At this price point, though, there's little room for any major complaints. You're getting a fully fledged Core i7 with enough change from £1,000 to get the bus home fifty times – depending on where you live. Graphics cards are easily upgraded, and the 4850 won't let you down that badly, we just wish that Dell had opted for a GPU that was a little more sprightly.